Boy, was it hard to come home from the cool temps of the mountains, it's been a scorcher around here (and it didn't help that we came home to this)! Maybe it's pretty hot where you live, too. 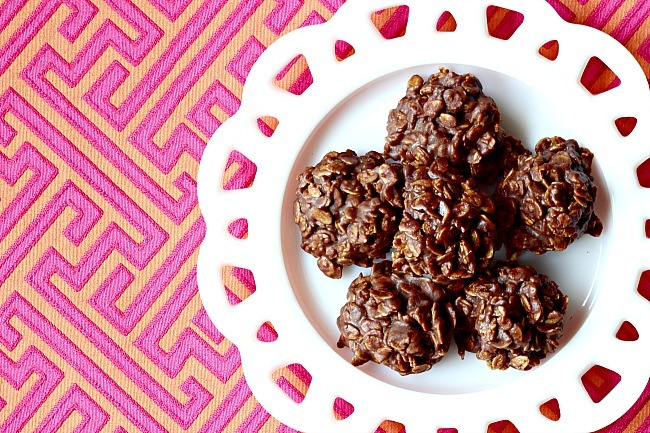 How about a sweet treat that you don't need to heat up the oven for? 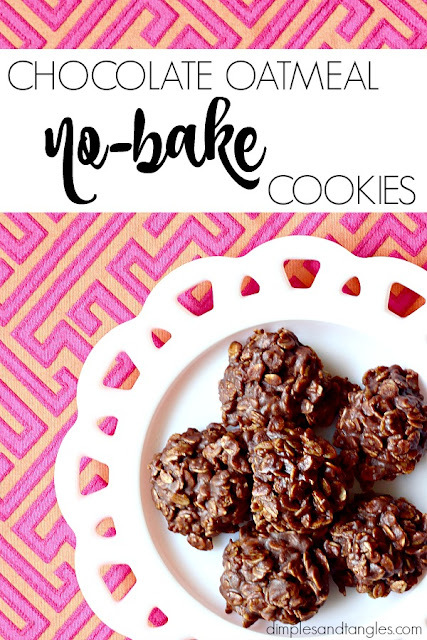 No-Bake Cookies to the rescue! I realize No-Bake Cookies are nothing new and recipes for them are probably a dime a dozen, but I thought I'd share my version to remind you to make some, or encourage you to give them a try if perhaps you never have! I'll bet you already have everything in your pantry that you need to make them, too. My first memory of no-bakes is making them in 8th grade Home Ec. class. Boy, were they tasty, but for whatever reason they never got made much at home. Fast forward 15 years, just days after delivering our son, when a sweet friend from church brought us dinner with no-bakes for dessert. I was reminded of what I had been missing out on by not making them! They've been in our regular cookie-making rotation ever since. Begin by melting the butter in a large sauce pan and adding in the sugar, cocoa, and milk. Stir to combine and heat to boiling, stirring often. Boil for two minutes while continuing to stir. Remove from heat and stir in the vanilla and peanut butter, stirring to combine and melt peanut butter. Add in oats and optional nuts. Allow to cool in pan 5-10 minutes, and then scoop out onto waxed paper. After cooling completely, store for several days in an air tight container to keep them from drying out. 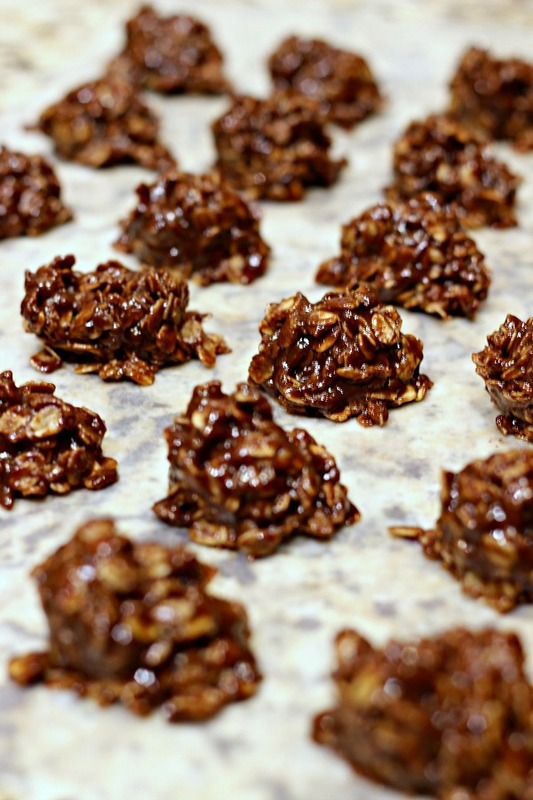 This recipe yields 2 dozen cookies when a 1 oz. scoop is used to form them. A smaller bite-sized scoop will make more! It's also a great recipe that the kids can help with. Enjoy! 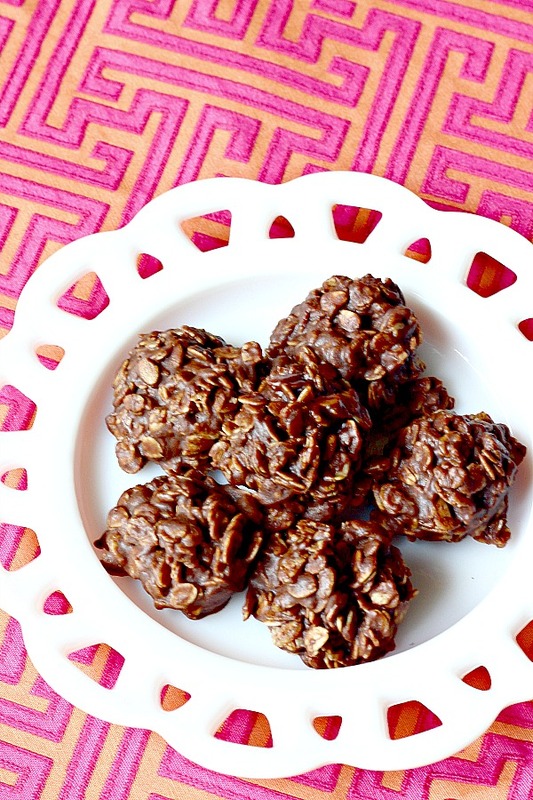 Do you have a favorite no-bake recipe? How is it different than this one? that pic of your daughter is hilarious! 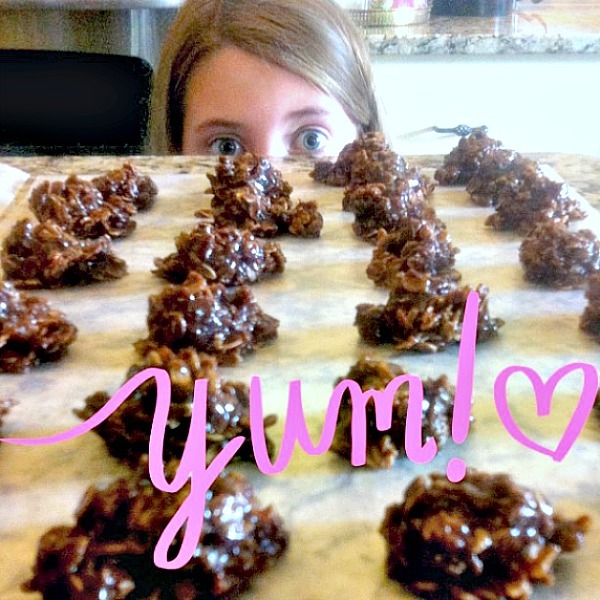 these look delish and like something emmy would love to make. One of our tried and true family favorites. ONE IMPORTANT note: it is a gamble to make this candy on a rainy day. It tends to NOT set up and stay sticky when it is raining. This has happened to me more than once...and I've been making this since I was a kid (now age 61). Enjoy! Yum! 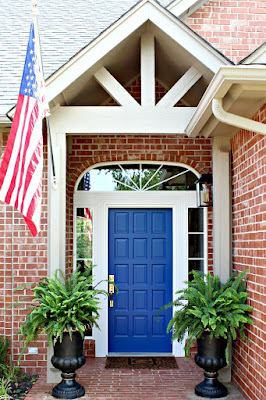 Now I want to go make some! I checked my cupboard and had just enough oats, so I made them! Yummy! I haven't had these since I was a kid. Thank you for reminding me of these and great to make on such a hot, summer day. No oven used.